I went home last weekend for my lovely younger sister's high school graduation (Congratulations, Amy!) and spent quite a bit of time helping to stage my mom's house. 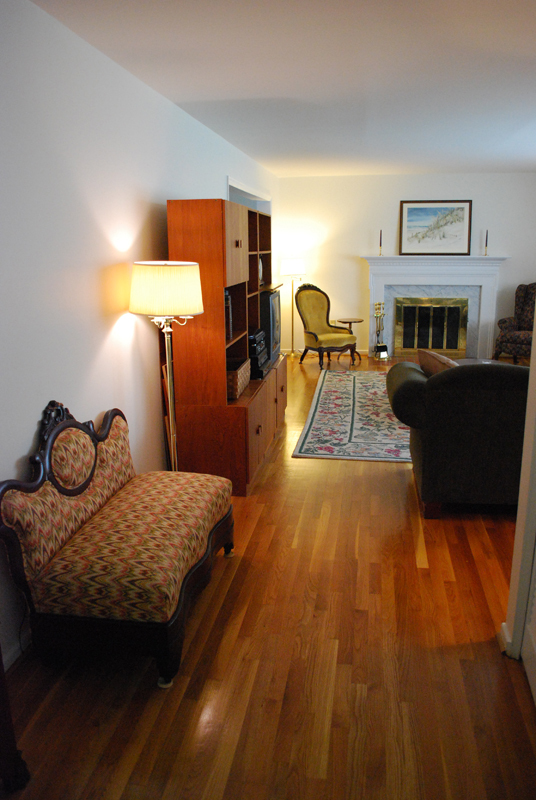 Front Hall: We rearranged some furniture pieces and decluttered quite a bit. This beautiful antique loveseat was passed down from my mom's parents. 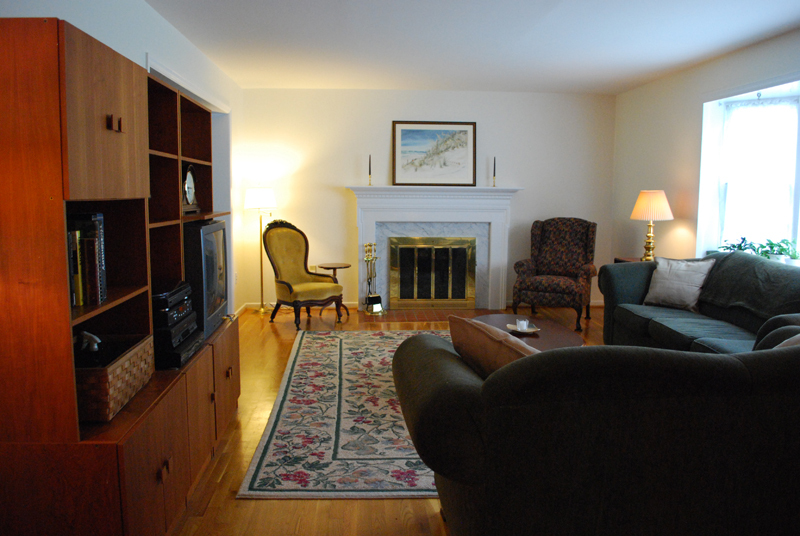 There is a coat closet across from the loveseat. Living Room: More decluttering and recently repainted walls emphasize the large size of the living room. The rug used to be in our dining room but the scale was too large for the room -- we moved it into the living room a few months ago to help define the seating arrangement. Underneath are beautifully refinished hardwood floors. Another lovely feature of the room is the bay window from which we removed several hanging decorations to maximize the light. Kitchen: This eat-in kitchen has great bones. The cabinets were updated in the mid-90s and are still in good condition. We decluttered the counters a bit and staged the table with some fun items my mom and sister, Jennifer, had around the house. Don't you want to live here? Dining Room with a deck off the back: Aren't those floors lovely? Take note of the chair rail and the ceiling medallion, too. We mostly just moved boxes out of this room and removed some personal photographs. A few months back, I also staged the hutch with some coordinating cranberry glassware that we inherited. Master Bedroom: In my opinion, this room is pretty darn spacious for a house built in the 1960s. We cleaned up a little in here and tried to make sure all of the linens coordinated with the existing neutral green/cream color scheme. 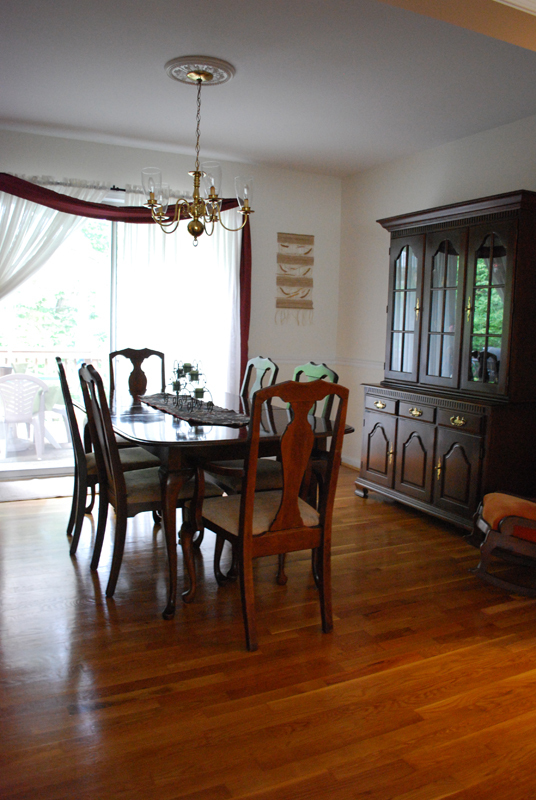 I also staged this adorable breakfast area in there (I told you it was spacious) with an antique card table and some chairs that my mom had against the wall in there. Tea, anyone? Another bedroom: This room used to be my bedroom when I was growing up. We staged it as a guest room (note the suitcase which we stuck there after we ran out of room in the closet). It looks a little different with my grandparents' antique bed and my great grandfather's secretary desk which we've inherited since I moved out. We rearranged some furniture in here and added a few antiques that had been cluttering up the living room. You can bet there's also a lot stored underneath that giant bed. There are hardwood floors under the carpet throughout the entire upstairs. Bedroom Three out of Four: This is the smallest bedroom but hosts a walk-in closet. This used to be my nursery. This is actually Amy's room at the moment -- she's already got super cute style so we didn't have to do much in here. She just took down a few photos. 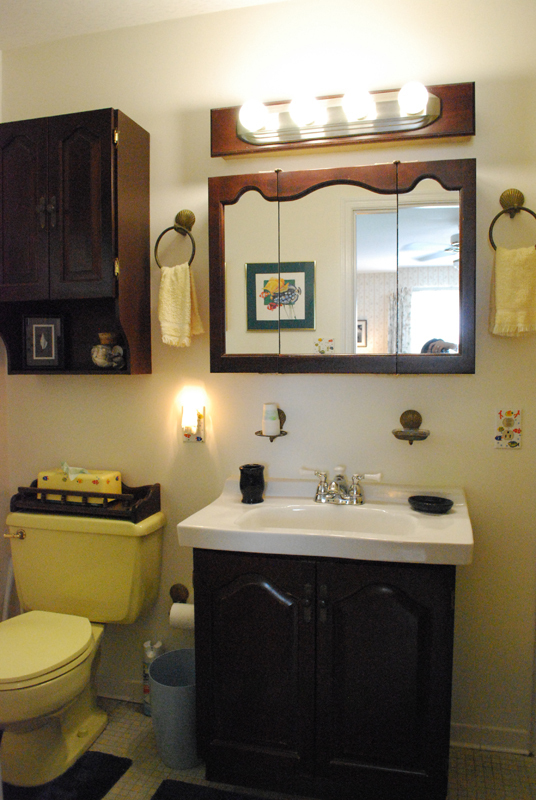 Hall bath: Double sinks and a vintage brown toilet (on the bright side, you won't have to clean it as often!). In here, we cleared off the counters quite a bit and borrowed some of Amy's graduation roses to dress it up (since they coordinate with the curtains). Full finished walk-out basement: The full finished basement is currently being used as a family room/office/game room/bar. It also features the third full bath and could be a fun "apartment" for a teenager or college graduate moved back home. In high school, my friend Dan and I painted the paneling a light gray to brighten things up. We got rid of quite a bit of the furniture down here about a year ago and staged it with some of my grandparents' old bamboo furniture. There's also a vintage tiki bar in the back corner and an old library table turned computer desk in the office. Behind this wall with the gaucho watercolor prints, there is a full shop/utility room with lots of storage space.